The Million Dollar Mysteries. Yep, that’s the name of Mindy Starns Clark’s very first series. It just has a fun ring to it if you ask me and the series is just that, and a whole lot more. That’s one of the reasons I chose this five book series to kick off the Mystery and Mayhem portion of my blog. It has plenty of elements that make it a satisfying mystery in both the classical and contemporary sense. After the tragic death of her husband, Callie Webber decided to start her life entirely over; new home, new dog, new job. Leaving behind a successful law career for a job as a financial investigator for a charity organization called the J.O.S.H.U.A. Foundation seemed like a perfect fit. The only problem is every time Callie starts an investigation on a new charity someone, somewhere, shows up dead. Classic, right? Just like in every good mystery series featuring the same armature detective, each new novel shows the heroine inadvertently stumbling upon a murder. From the president of a major “food for the hungry” type charity to a migrant farmhand working with a local educational center, no one is safe, but Callie is there to learn the true. The mystery side of these stories really is quite good. You get the classic dead body/group suspects/suspicious circumstances equation with a satisfying “Oh, I didn’t think of that” reveal at the end. A contemporary edge? Unlike a lot of classic mysteries staring an amateur sleuth, the five book series can also be read as one book about a young widow overcoming all the facets of grief even as a new relationship with the mysterious owner of the J.O.S.H.U.A. Foundation forms. And yes, this new man in her life is just as big of a mystery as many of the crimes she’s become involved with. The emotional and spiritual journey of healing old wounds and finding new hope is, I thought, very well done…and of course it gets all the better when, just as Callie finally feels she really has a second chance at love, it starts to look like the terrible accident that took her husband’s life might not have been an accident after all. Did I mention each book takes place in a different, often dramatic location? Well, anyway, this series is worth the read and I’ve noticed they’ve recently been rereleased with new covers. All the better. 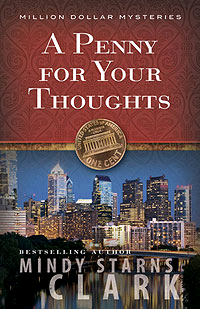 In order, the titles are: A Penny for Your Thoughts, Don’t Take Any Wooden Nickels, A Dime a Dozen, A Quarter for a Kiss, and The Buck Stops Here. So, do you know a mystery series that you think combines the classic with the contemporary? Before I can even think about the book… we have to discuss the new dog thing. I understand why Ms. Webber might want to start her life completely over… I understand the new home and the new job, and the new everything else, but… a new dog? Well, I really should reply with a “You’ll just have to read the book” but since I like you I’ll go a head and give you this tidbit. The dog Callie previously owned actually belong to her husband. The dog was behaving just as distraught over the death as well and Callie couldn’t take it anymore. So, she gave the dog to her brother and got a dog of her own (of the small. fluffy variety if I recall correctly). This incident occurs before the book series starts and is simply remembered later on…though I can’t quite remember right now in which book it is remembered in. If you hadn’t, I’m pretty sure I would have continued to feel kind of like… a dog (of the large, floppy-eared, tail-wagging variety) that just saw someone throw out the terribly aromatic remains of the turkey carcass – after Thanksgiving dinner – and thought “???!!!”. Good point. I guess I was making a mountain out of a mole-hill. Or no… that would be a Great Dane out of a Chihuaua.